This is a blade for one of the huge wind turbines. These have three of these blades, each weighing about 18,000 pounds and with a length of about 200 feet. They are made by an Indian company, Suzlan. 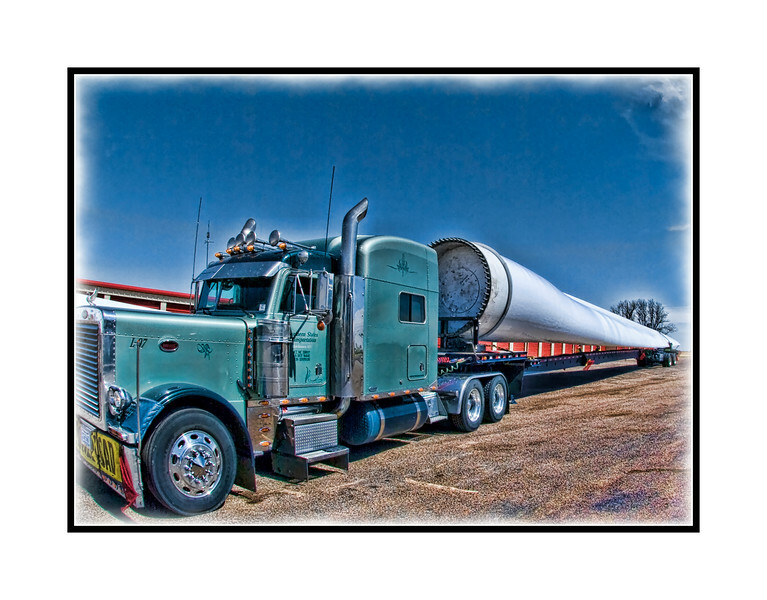 The truck driver said they were delivering the blades to a John Deere wind farm near Gruber, TX in the panhandle near the OK border. We actually saw three trucks, each carrying one blade. When we initially saw the trucks, we were filling up our gas tank in a little Texas town. We decided to chase them down, pass all of them, get about ten minutes ahead and I would jump out with my camera and tripod and set up on the side of the road to capture them when they came along. Just after we passed the third truck, Phil saw all of them pull off the side of the road and stop. We made a quick U-turn and high-tailed it back to where they were stopped. I got out and asked permission to shoot their truck and load. When you see these things, you can hardly believe what you are seeing. I took the pictures with a fish eye lens, since these things are soooo long. I'm going to post this and hit the hay. Thanks to all of you who commented on my roadrunner pic. I sure enjoyed everybody else's shots today. I have to say my favorite was Jennifer's shot of Emily leaping in the air. Have a great day, everyone! Perfect process it is the angle which gives it scope. nicely done! talk about the long haul! Cool shot, Judy, and great work to get it. I've only ever seen these things from the air, where you really have no sense of scale. One of those things I've never seen before.. They don't come anywhere near out Pacific Northwest. Great capture, and editing.